Thanksgiving seems so early this year!!! Everyone thinks it should be next week…but it is Thursday! 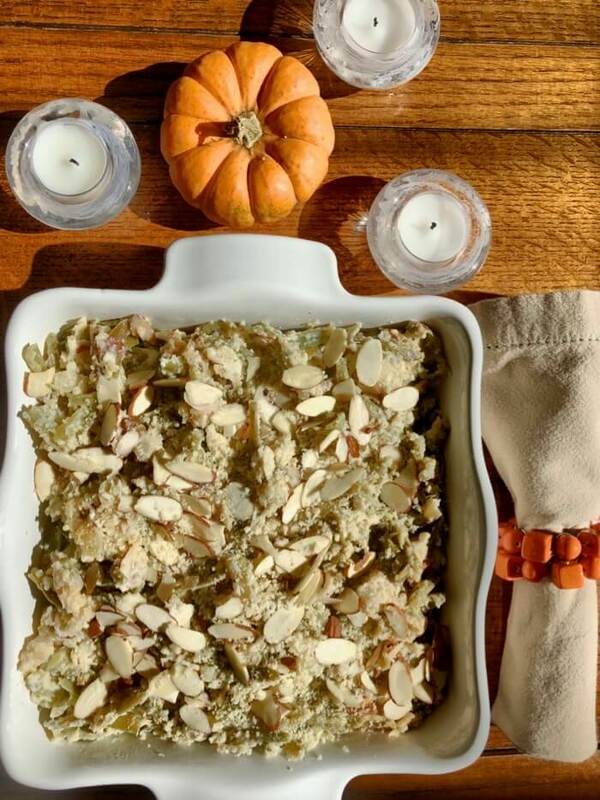 I thought I would share a recipe for the old standby green bean casserole…but with a new twist… Adding chopped water chestnuts, lemon, almonds and panko bread crumbs. 1/2 cup salted butter, divided, 2 T. and 6 T.
Squeeze thawed green beans lightly to remove water. Stir together 2 tablespoons melted butter, 1 cup panko, 1 cup almonds, 1/2 teaspoon salt and set aside. Heat 2 tablespoons of the butter in a Dutch oven over medium high heat. Add onion and cook, stirring often until mixture is caramelized, about 8 minutes. Transfer onions to plate and without wiping out Dutch oven, add remaining 6 tablespoons butter. Melt butter over medium high; whisking flour, and cook, whisking constantly 1 minute. Gradually add milk, whisking until smooth. Cook, whisking, until thickened and bubbly, about 4 minutes. Remove from heat, and whisk in Parmesan cheese, kosher salt and black pepper and 1 tablespoon lemon juice until melted and smooth. Spoon into a lightly greased baking dish. Bake in preheated oven until bubbly around edges, 15 minutes. To make ahead, prepare recipe through step 9, up to 3 days in advance; cover and refrigerate. On the day of, resume with step 10. Bake 15 minutes (10 minutes more if cold from refrigerator). Add toppings and bake 30 minutes more. This time of year is perfect for recipes containing pecans. I remember my south Georgia grandmother sending us a huge package of pecans every year just before Thanksgiving and Christmas. 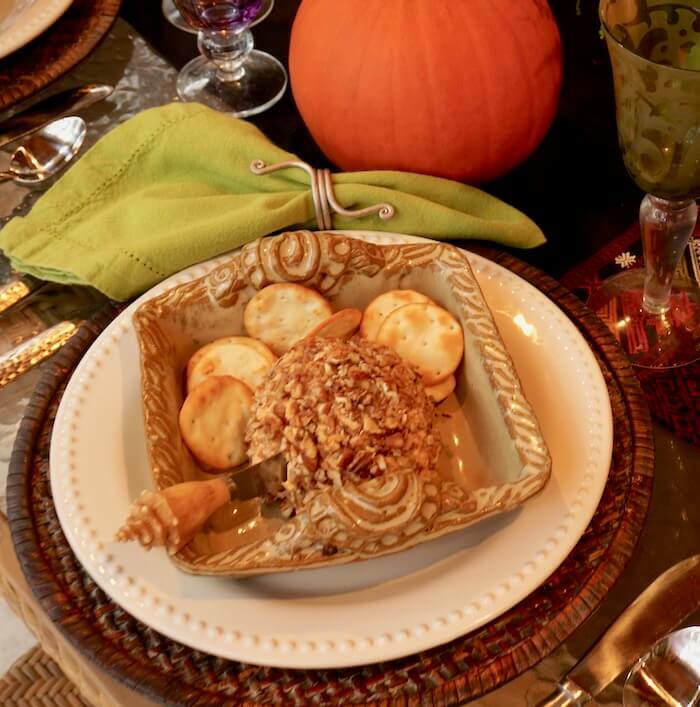 I am including 3 recipes using pecans, perfect for Thanksgiving appetizers or desserts. Great for tailgating or homegating during those big rivalry games this weekend. The pimento cheese recipe is from Jessica Parks Hurst, a Vanderbilt alumni and cousin. This is Rivalry Week and she and I will be on opposite sides of the gridiron. I will still love her! and Go Vols!!! Combine in a food processor, pulse to achieve desired consistency. This recipe should be refrigerated in a small bowl for 3 hours. Transfer to wax paper, shape into ball and roll in pecans. These are my go to cookies any time I need to bring something sweet to a tailgate or a party. They are that good!!!! In bowl of electric mixer, combine the butter and brown sugar. Beat until well blended. Gradually add the flour mixture just until blended. Drop by rounded teaspoonful onto greased cookie sheets, placing the cookies 2 inches apart from one another. Flatten each cookie slightly with a fork. 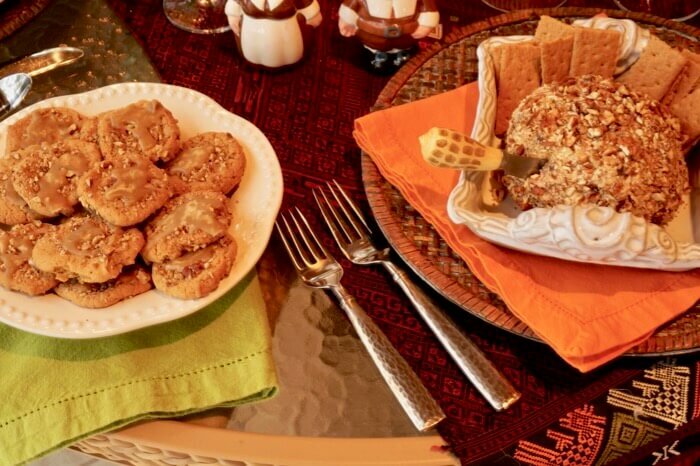 Sprinkle each cookie with approximately 1 teaspoon chopped pecans. Bake 10 minutes or until golden. Transfer onto wire racks to cool. In a 1 ½ to 2-quart saucepan, combine the brown sugar and whipping cream. Place over medium-high heat, stirring until the sugar dissolves and the cream comes to a boil. Boil, stirring constantly for 1 minute. Remove from heat and blend in the powdered sugar. Beat until smooth. Drizzle cooled cookies generously with the icing. 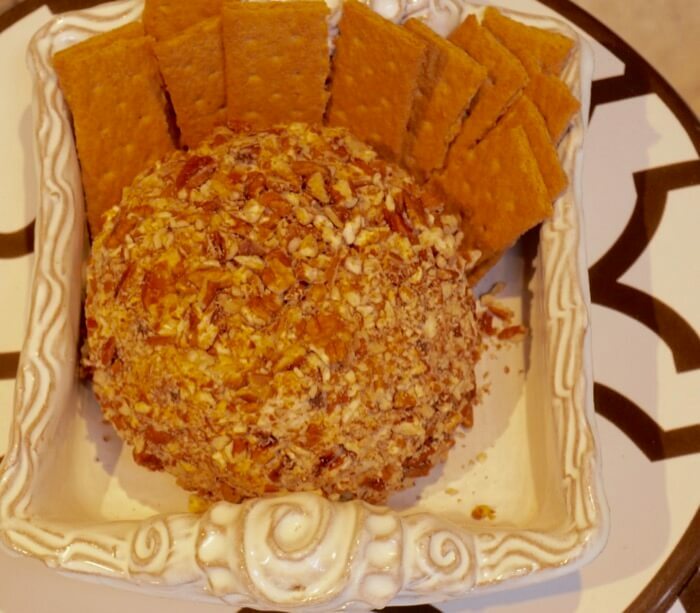 Chocolate Chip Cheese Ball from Pam Hope, a huge Auburn fan. Pam has contributed many great recipes for “Tailgating Through The South”. WOW so sweet and so good! Beat cream cheese, butter, and vanilla until fluffy. Place on plastic wrap, shape into a ball. Just before serving, roll cheese ball in pecans. This is a surprise to most guests. It looks like the traditional cheese ball, but when people bite into it--WOW so sweet and so good! HAPPY THANKSGIVING AND… NOW ON TO FOOTBALL AND RIVALRY WEEKEND! AND HEAR (HERE) AGAIN IS MY FAVORITE QUOTE!!! I didn’t get the email until the day after Thanksgiving, but I will definitely be trying the recipes for Christmas ! Live to you, Dave, and family !!! Thank you Myra! Hope you try the green beans for Christmas…or any of the pecan recipes…Hope your Thanksgiving was lovely (on the beach) and look forward to the Christmas season! Love you friend!